CAN REYNES is a villa with an outdoor pool, located in Llubí. 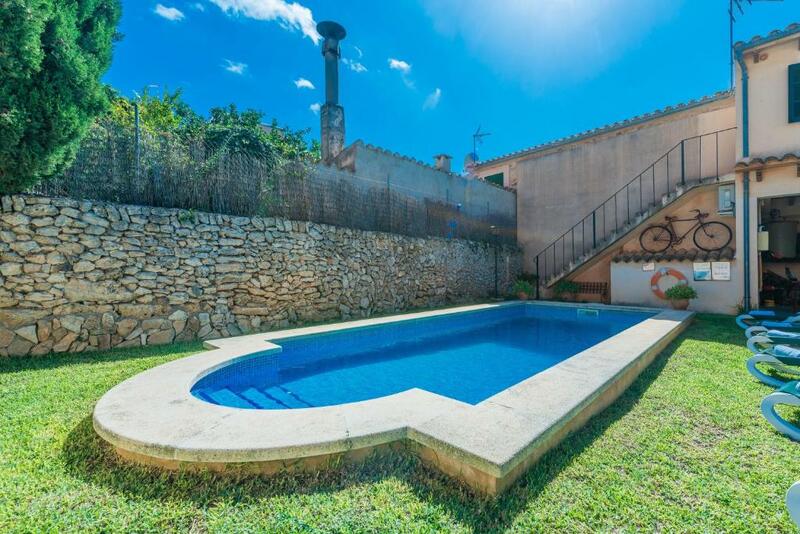 The property features views of the pool and is 29 mi from Palma de Mallorca. There is a seating area, a dining area and a kitchen as well as a private bathroom. A TV is offered. Other facilities at CAN REYNES include a terrace. Alcudia is 14 mi from the property. The nearest airport is Palma de Mallorca Airport, 29 mi from the property. When would you like to stay at Can Bagot? 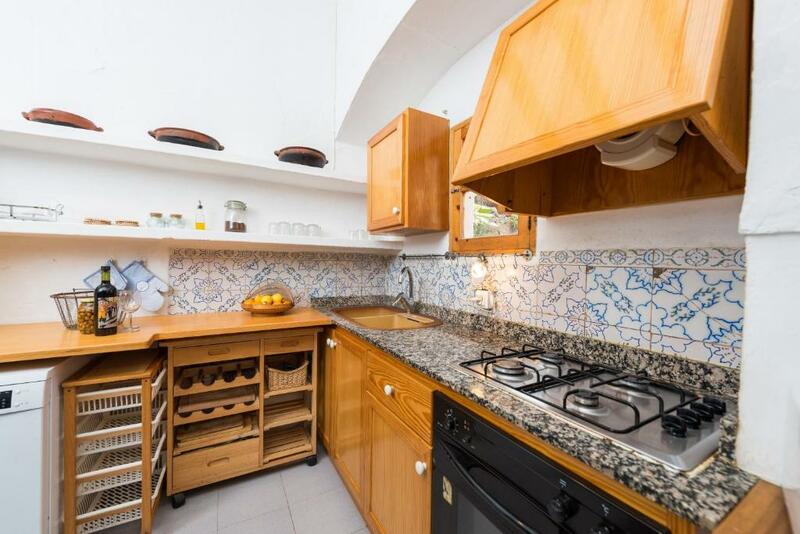 This villa has a oven, tumble dryer and dishwasher. Welcome to this typical village house divided in two buildings: A two floor main house, with a fantastic terrace, a barbecue and a garden. A little house is located in front of the main one, with a lovely 8x4m chlorine swimming pool, and a deph ranging that goes from 0.50m to 2m. Only a few steps separate you from this area. There is also a basketball hoop for your entertainment. The main house has a gas kitchen and an independent dining-room at the ground floor. Upstairs, you will find a comfortable majorcan style living-room, with a beautiful stone wall and typical vaults. There are four bedrooms with air conditioning and a wardrobe each, two of them with a double bed and a bathroom en suite with a bath. The other two dispose of two single beds each, and one of them also a bathroom with a bath. If you travel with babies, we can provide up to two cots and one high chair. Obviously, there is an independent laundry area with a washing machine, a dryer, an iron and an ironing board. The attached house is a little welcoming studio. At the same room, with air conditioning, there are a kitchen with a dining-room area, a bedroom with a double bed and a bathroom with a bath. We are a professional vacation rental agency. Llubí is a little village at the center of the island, of about 2000 residents, most of them locals. You can find basic services as grocery stores, some coffee shops, etc. At only about 20 minutes driving, you will arrive to Alcúdia bay, ideal for spending at the idylic beaches, with crystalized water and white and thin sand. Puerto de Alcúdia area is the most lively one. It has a long promenade full of beach bars, clothes shops, grocery shops, restaurants and bars. At night, becomes a place full of life. House Rules Can Bagot takes special requests – add in the next step! Can Bagot accepts these cards and reserves the right to temporarily hold an amount prior to arrival. Please note that late check-in after 00:00 has an extra cost of EUR 50, to be paid in cash upon arrival. Please note that social events are not allowed at this property. Please inform Can Bagot of your expected arrival time in advance. You can use the Special Requests box when booking, or contact the property directly using the contact details in your confirmation. We need at least 5 reviews before we can calculate a review score. If you book and review your stay, you can help Can Bagot meet this goal.